"Night Fighters" redirects here. For the 1960 film also known as The Night Fighters, see A Terrible Beauty (film). A night fighter (also known as all-weather fighter or all-weather interceptor for a period of time after World War II) is a fighter aircraft adapted for use at night or in other times of bad visibility. Night fighters began to be used in World War I and included types that were specifically modified to operate at night. During World War II, night fighters were either purpose-built night fighter designs, or more commonly, heavy fighters or light bombers adapted for the mission, often employing radar or other systems for providing some sort of detection capability in low visibility. Many WW II night fighters also included instrument landing systems for landing at night, as turning on the runway lights made runways into an easy target for opposing intruders. Some experiments tested the use of day fighters on night missions, but these tended to work only under very favorable circumstances and were not widely successful. Avionics systems were greatly miniaturized over time, allowing the addition of radar altimeter, terrain-following radar, improved instrument landing system, microwave landing system, Doppler weather radar, LORAN receivers, GEE, TACAN, inertial navigation system, GPS, and GNSS in aircraft. The addition of greatly improved landing and navigation equipment combined with radar led to the use of the term all-weather fighter or all-weather fighter attack, depending on the aircraft capabilities. The use of the term night fighter gradually faded away as a result of these improvements making the vast majority of fighters capable of night operation. At the start of World War I, most combatants had little capability of flying at night, and little need to do so. The only targets that could be attacked with any possibility of being hit in limited visibility would be cities, an unthinkable target at the time. The general assumption of a quick war meant no need existed for strategic attacks. Things changed on 22 September and 8 October 1914, when the Royal Naval Air Service bombed the production line and hangars of the Zeppelin facilities in Cologne and Düsseldorf. Although defences had been set up, all of them proved woefully inadequate. As early as 1915,[N 1] a number of B.E.2c aircraft (the infamous "Fokker Fodder") were modified into the first night fighters. After lack of success while using darts and small incendiary bombs to attack Zeppelins from above, ultimately a Lewis gun loaded with novel incendiary ammunition, was mounted at an angle of 45° to fire upwards, to attack the enemy from below. This technique proved to be very effective. Because of airships' limitations, the Luftstreitkräfte began to introduce long-range heavy bombers, starting with the Gotha G.IV aircraft that gradually took over the offensive. While their early daylight raids in May 1917 were able to easily evade the weak defenses of London, the strengthening of the home defence fighter force led to the Germans switching to night raids from 3 September 1917. To counter night attacks, Sopwith Camel day fighters were deployed in the night fighter role. The Camels' Vickers guns were replaced by Lewis guns mounted over the wings, as the flash from the Vickers tended to dazzle the pilot when they were fired, and synchronised guns were considered unsafe for firing incendiary ammunition. Further modification led to the cockpit being moved rearwards. The modified aircraft were nicknamed the "Sopwith Comic". To provide suitable equipment for Home Defence squadrons in the north of the UK, Avro 504K trainers were converted to night fighters by removing the front cockpit and mounting a Lewis gun on the top wing. With little money to spend on development, especially during the Great Depression, night-fighting techniques changed little until just prior to World War II. In the meantime, aircraft performance had improved tremendously; compared to World War I versions, modern bombers could fly about twice as fast, at over twice the altitude, with much greater bomb loads. They flew fast enough that the time between detecting them and the bombers reaching their targets left little time to launch interceptors to shoot them down. Antiaircraft guns were similarly affected by the altitudes at which they flew, which required extremely large and heavy guns to attack them, which limited the number available to the point of being rendered impotent. At night, or with limited visibility, these problems were compounded. The widespread conclusion was that "the bomber will always get through", and the Royal Air Force invested almost all of their efforts in developing a night bomber force, with the Central Flying School responsible for one of the most important developments in the period by introducing "blind flying" training. The Spanish Republican Air Force used some Polikarpov I-15s as night fighters. Pilot José Falcó had equipped his fighter with a radio receiver for land-based guidance for interception. One of the I-15s configured for night operations, fitted with tracer and explosive .30 rounds, scored a daylight double victory against Bf 109s in the closing stages of the war. Nevertheless, some new technologies appeared to offer potential ways to improve night-fighting capability. During the 1930s, considerable development of infrared detectors occurred among all of the major forces, but in practice, these proved almost unusable. The only such system to see any sort of widespread operational use was the Spanner Anlage system used on the Dornier Do 17Z night fighters of the Luftwaffe. These were often also fitted with a large IR searchlight to improve the amount of light being returned. Immediately prior to the opening of the war, radar was introduced operationally for the first time. Initially, these systems were unwieldy, and development of IR systems continued. Realizing that radar was a far more practical solution to the problem, Robert Watson-Watt handed the task of developing a radar suitable for aircraft use to 'Taffy' Bowen in the mid-1930s. In September 1937, he gave a working demonstration of the concept when a test aircraft was able to detect three Home Fleet capital ships in the North Sea in bad weather. The promising implications of the test were not lost on planners, who reorganized radar efforts and gave them increased priority. This led to efforts to develop an operational unit for airborne interception (AI). The size of these early AI radars required a large aircraft to lift them, and their complex controls required a multiperson crew to operate them. This naturally led to the use of light bombers as the preferred platform for airborne radars, and in May 1939, the first experimental flight took place, on a Fairey Battle. The war opened on 1 September 1939, and by this time, the RAF were well advanced with plans to build a radar – then called 'RDF' in Britain – equipped night-fighter fleet. The Airborne Interception Mk. II radar (AI Mk. II) was well on its way to becoming operational, and the Bristol Blenheim was increasingly available for fitting. The first operational system went into service in November 1939, long before the opening of major British operations. Several improved versions followed, and by the time the Blitz opened in 1940, the AI Mk.IV was available and offered greatly improved performance with a range between 20,000 and 400 feet. This greatly reduced the load on the Chain Home ground-controlled interception component of the night-fighter system, who only had to get the fighter within four miles before the fighter's radar would be able to let them take over during the attack. Due to the relatively low performance of the Blenheim (a converted bomber) the British experimented with using RDF-equipped Douglas Havoc bombers converted to carry a searchlight, illuminating the enemy aircraft for accompanying Hurricane single-engine fighters to shoot down. 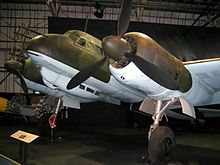 Known as the Turbinlite, the idea was not a success, and in time, both the Blenheim and the Turbinlite were replaced, first by night fighter versions of the Beaufighter and then by the even higher-performing de Havilland Mosquito, which would later accompany the bomber stream on raids over Germany. In this role, support was provided by No. 100 Group RAF with Mosquitos fitted with an assortment of devices, such as Perfectos and Serrate, for homing-in on German night fighters. The British also experimented with mounting pilot-operated AI Mark 6 radar sets in single-seat fighters, and the Hurricane II C(NF), a dozen of which were produced in 1942, became the first radar-equipped, single-seat night fighter in the world. It served with 245 and 247 Squadrons briefly and unsuccessfully before being sent to India to 176 Squadron, with which it served till the end of 1943. A similarly radar-equipped Hawker Typhoon was also produced, but no production followed. German efforts at this point were years behind the British. Unlike Britain, where the major targets lay only a few minutes' flight time from the coast, Germany was protected by large tracts of neutral territory that gave them long times to deal with intruding bombers. Instead of airborne radar, they relied on ground-based systems; the targets would first be picked up by radar assigned to a "cell", the radar would then direct a searchlight to "paint" the target, allowing the fighters to attack them without on-board aids. The searchlights were later supplanted with short-range radars that tracked both the fighters and bombers, allowing ground operators to direct the fighters to their targets. By July 1940, this system was well developed as the Kammhuber Line, and proved able to deal with the small raids by isolated bombers the RAF was carrying out at the time. At the urging of R.V. Jones, the RAF changed their raid tactics to gather all of their bombers into a single "stream". This meant that the ground-based portion of the system was overwhelmed; with only one or two searchlights or radars available per "cell", the system was able to handle perhaps six interceptions per hour. By flying all of the bombers over a cell in a short period, the vast majority of the bombers flew right over them without ever having been plotted, let alone attacked. German success against the RAF plummeted, reaching a nadir on 30/31 May 1942, when the first 1,000-bomber raid attacked Cologne, losing only four aircraft to German night fighters. In 1942, the Germans first started deploying the initial B/C low UHF-band version of the Lichtenstein radar, and in extremely limited numbers, using a 32-dipole element Matratze (mattress) antenna array. This late date, and slow introduction, combined with the capture of a Ju 88R-1 night fighter equipped with it in April 1943 when flown to RAF Dyce, Scotland, by a defecting Luftwaffe crew, allowed British radio engineers to develop jamming equipment to counter it. A race developed with the Germans attempting to introduce new sets and the British attempting to jam them, with the British holding the upper hand throughout. The early Lichtenstein B/C was replaced by the similar UHF-band Lichtenstein C-1, but when the German night fighter defected and landed in Scotland in April 1943, that radar was quickly jammed. The low VHF-band SN-2 unit that replaced the C-1 remained relatively secure until July 1944, but only at the cost of using huge, eight-dipole element Hirschgeweih (stag's antlers) antennae that slowed their fighters as much as 25 mph, making them easy prey for British night fighters that had turned to the offensive role. The capture in July 1944 of a Ju 88G-1 night fighter of NJG 2 equipped with an SN-2 Lichtenstein set, flown by mistake into RAF Woodbridge, revealed the secrets of the later, longer-wavelength replacement for the earlier B/C and C-1 sets. The Luftwaffe also experimented with single-engined aircraft in the night-fighter role, which they referred to as Wilde Sau (wild boar). In this case, the fighters, typically Focke-Wulf Fw 190s, were equipped only with a direction finder and landing lights to allow them to return to base at night. For the fighter to find their targets, other aircraft, which were guided from the ground, would drop strings of flares in front of the bombers. In other cases, the burning cities below provided enough light to see their targets. Messerschmitt Bf 109G variants had G6N and similar models fitted with FuG 350 Naxos "Z" radar receivers for homing in on the 3-gigahertz band H2S emissions of RAF bombers — the April 1944 combat debut of the American-designed H2X bomb-aiming radar, operating at a higher 10 GHz frequency for both RAF Pathfinder Mosquitos and USAAF B-24 Liberators that premiered their use over Europe, deployed a bombing radar that could not be detected by the German Naxos equipment. The Bf 109G series aircraft fitted with the Naxos radar detectors also were fitted with the low- to mid-VHF band FuG 217/218 Neptun active search radars, as were Focke-Wulf Fw 190 A-6/R11 aircraft: these served as radar-equipped night-fighters with NJGr 10 and NJG 11. A sole Fw 190 A-6 Wk.Nr.550214 fitted with FuG 217 is a rare survivor. The effective Schräge Musik [N 3] offensive armament fitment was the German name given to installations of upward-firing autocannon mounted in large, twin-engined night fighters by the Luftwaffe and both the Imperial Japanese Navy Air Service and Imperial Japanese Army Air Service during World War II, with the first victories for the Luftwaffe and IJNAS each occurring in May 1943. This innovation allowed the night fighters to approach and attack bombers from below, where they were outside the bomber crew's field of view. Few bombers of that era carried defensive guns in the ventral position. An attack by a Schräge Musik-equipped fighter was typically a complete surprise to the bomber crew, who would only realize that a fighter was close by when they came under fire. Particularly in the initial stage of operational use until early 1944, the sudden fire from below was often attributed to ground fire rather than a fighter. Rather than nighttime raids, the US Army Air Forces were dedicated to daytime bombing over Germany and Axis allies, that statistically were much more effective. The British night-bombing raids showed a success rate of only one out of 100 targets successfully hit. [page needed] At the urging of the British, who were looking to purchase US-made aircraft, US day fighters were initially adapted to a night role, including the Douglas P-70 and later Lockheed P-38M "Night Lightning". The only purpose-built night fighter design deployed during the war, the American Northrop P-61 Black Widow was introduced first in Europe and then saw action in the Pacific, but it was given such a low priority that the British had ample supplies of their own designs by the time it was ready for production. The first USAAF unit using the P-61 did not move to Britain until February 1944; operational use did not start until the summer, and was limited throughout the war. Colonel Winston Kratz, director of night-fighter training in the USAAF, considered the P-61 as adequate in its role, "It was a good night fighter. It did not have enough speed". The U.S. Navy was forced into the night-fighting role when Japanese aircraft successfully harassed their units on night raids. The Japanese Navy had long screened new recruits for exceptional night vision, using the best on their ships and aircraft instead of developing new equipment for this role. To counter these raids, the Navy fitted microwave-band, compact radar sets to the wings of its single-engined Grumman F6F Hellcat and Vought F4U Corsair fighters by the close of the war, operating them successfully in the Pacific. [N 4] In several cases these aircraft were used on raids of their own. Even while the war raged, the jet engine so seriously upset aircraft design that the need for dedicated jet-powered night fighters became clear. Both the British and Germans spent some effort on the topic, but as the Germans were on the defensive, their work was given a much higher priority. Their Messerschmitt Me 262 was adapted to the role and Oberleutnant Kurt Welter claimed 25 Mosquitos at night. Other forces did not have the pressing need to move to the jet engine; Britain and the US were facing enemies with aircraft of even lower performance than their existing night fighters. However, the need for new designs was evident, and some low-level work started in the closing stages of the war, including the US contract for the Northrop F-89 Scorpion. When the Soviet plans to build an atomic bomb became known in the west in 1948, this project was still long from being ready to produce even a prototype, and in March 1949, they started development of the North American F-86D Sabre and Lockheed F-94 Starfire as stop-gap measures. All of them entered service around the same time in the early 1950s. In the Korean War, after Starfires proved ineffective, Marine Corps Douglas F3D Skyknights shot down six aircraft, including five Mikoyan-Gurevich MiG-15s without loss, as the MiG-15s lacked radar to shoot down individual fighters, though they were effective against bomber formations at night. The RAF began studies into new fighter designs in the immediate postwar era, but gave these projects relatively low priority. By the time of the Soviet bomb test, the night-fighter design was still strictly a paper project, and the existing Mosquito fleet was generally unable to successfully intercept the Tupolev Tu-4 bomber it was expected to face. This led to rushed programs to introduce new, interim night-fighter designs, leading to night-fighter versions of their Gloster Meteor in 1951, along with a similar conversion of the de Havilland Vampire. These were followed by the de Havilland Venom in 1953 and then Navy's de Havilland Sea Venom. The advanced night-fighter design was eventually introduced in 1956 as the Gloster Javelin, by this time essentially outdated. In Canada, Avro Canada introduced the CF-100 Canuck, which entered service in 1952. Night fighters existed as a separate class into the 1960s. As aircraft grew in capability, radar-equipped interceptors could take on the role of night fighters and the class went into decline. Examples of these latter-day interceptor/night-fighters include the Avro Arrow, Convair F-106 Delta Dart, and English Electric Lightning. At the time the McDonnell Douglas F-4 Phantom II was offered to the Navy, the Vought F-8 Crusader had already been accepted as a "day" dogfighter, while the subsonic McDonnell F3H Demon was the Navy's all-weather fighter. The Phantom was developed as the Navy's first supersonic, all-weather, radar-equipped fighter armed with radar-guided missiles. However, compared to early air-superiority designs such as the F-100 or F-8, the massive Phantom, nevertheless, had enough raw twin-J79 power to prove adaptable as the preferred platform for tangling with agile MiG-17 and MiG-21 fighters over the skies of Vietnam, as well as replacing the US Air Force Convair F-102 Delta Dagger and Convair F-106 Delta Dart for continental interception duties and the Republic F-105 Thunderchief as a medium fighter-bomber. The need for close-in dogfighting spelled the end for the specialized Grumman F-111B, which was armed only with long-range AIM-54 Phoenix missiles for fleet defense against bombers. The Navy instead developed the Grumman F-14 Tomcat, which on top of the heavy Phoenix, retained the Phantom's versatility and improved agility for dogfighting. The McDonnell Douglas F-15 Eagle was also an interceptor with enhanced agility, but did not carry the Phoenix in preference to the role of an air-superiority fighter. The reduced size and costs of avionics have allowed even smaller modern fighters to have night-interception capability. In the US Air Force's lightweight fighter program, the F-16 was originally envisaged as inexpensive day fighter, but quickly converted to an all-weather role. The similar McDonnell Douglas F/A-18 Hornet in its CF-18 variant for the RCAF, was ordered with a 0.6 Mcd night-identification light to enhance its night-interception capabilities. Reggiane Re.2001CN Serie I,II,III "Falco"
^ "October 13th 1915... [Second Lieutenant John Slessor] lifted his BE2c into the blackness to search for the intruder." ^ By 1918, only four Zeppelin raids against London were mounted. ^ The Hellcat proved to be the best single-engined night fighter deployed in World War II. ^ Winchester 2006, p. 184. ^ Cooper, Ralph, Jean-Claude Cailliez and Gian Picco. "Alfred Comte 1895–1965." earlyaviators.com, 19 November 2005. Retrieved: 15 April 2011. ^ Madison, Rodney. "Air Warfare, Strategic Bombing". The Encyclopedia of World War I: A Political, Social and Military History, Volume 1, Spencer C. Tucker, ed. (Santa Barbara: ABC-CLIO, 2005), pp. 45–46. ^ Evans 1996, pp. 3–4. ^ Gunston 1976, p. 27. ^ Knell 2003, pp. 109–111. ^ a b Gray and Thetford 1962, p. 130. ^ Unikoski, Ari. "The War in the Air: Bombers: Germany, Zeppelins." firstworldwar.com, 22 August 2009. Retrieved: 13 April 2011. ^ Bruce 1968, p. 151. ^ Bruce 1965, pp. 35–36. ^ Robinson 1988, p. 24. ^ Lázaro, Carlos. "Los chatos noctumos" (in Spanish) Adar. Retrieved: 4 August 2013. ^ Henini and Razeghi 2002, p. 128. ^ Robinson 1988, p. 34. ^ Robinson 1988, p. 28. ^ Rawnsley and Wright 1998, p. 151. ^ Robinson 1988, p. 68. ^ Jones 1978, pp. Preface, p. 500. ^ Price 2006, p. 67. ^ Scutts and Weal 1998, pp. 46–47. ^ Wilson 2008, p. 3. ^ Currie 1999, p. 11. ^ Pape 1992, p. 208. ^ Gunston 1976, p. 184. ^ Gunston 1976, pp. 112, 183–184. Bruce, J.M. War Planes of the First World War: Volume One: Fighters. London: Macdonald, 1965. Bruce, J.M. War Planes of the First World War: Volume Two: Fighters. London: Macdonald, 1968. ISBN 0-356-01473-8. Currie, Jack. Battle Under the Moon. London: Crecy Publishers, 1999. ISBN 978-0-85979-109-0. Evans, J. The Dragon Slayers. Chesham, UK: Steemrok Publishing Services, 1996. No ISBN. Gray, Peter and Owen Thetford. German Aircraft of the First World War. London: Putnam, 1961. Guerlac, Henry E. Radar in World War II. Los Angeles: Tomash, 1987. ISBN 978-0-7503-0659-1. Gunston, Bill. Night Fighters: A Development and Combat History. New York: Charles Scribner’s Sons, 1976. ISBN 978-0-7509-3410-7. Haulman, Daniel L. and William C. Stancik, eds. Air Force Victory Credits: World War I, World War II, Korea and Vietnam. Maxwell Air Force Base, Alabama: USAF Historical Research Center, 1988. Heaton, Colin and Anne-Marie Lewis. Night Fighters: Luftwaffe and RAF Air Combat over Europe, 1939–1945. Annapolis, Maryland: Naval Institute Press, 2008. ISBN 978-1-59114-360-4. Henini, Mohamed and M. Razeghi. Handbook of Infrared Detection Technologies. Rio de Janeiro: Elsevier Science, 2002. ISBN 978-1-85617-388-9. Johnsen, Frederick A. Darkly Dangerous: The Northrop P-61 Black Widow Night Fighter. Tacoma, Washington: Bomber Books, 1981. OCLC 11043715. Jones, Reginald Victor. The Wizard War: British Scientific Intelligence, 1939–1945. New York: Coward, McCann & Geoghegan, 1978. ISBN 978-0-698-10896-7. Knell, Hermann. To Destroy a City: Strategic Bombing and its Human Consequences in World War II. New York: Da Capo Press, 2003. ISBN 0-306-81169-3. Ledwoch, Janusz and Adam Skupiewski. Messerschmitt Me.109 Cz.2. Gdansk, Poland: AJ Press Monografie Lotnicze, 1994. ISBN 83-86208-02-3. Marchant, David J. Rise from the East: The story of 247 (China British) Squadron Royal Air Force. Tonbridge, Kent, UK: Air Britain (Historians) Ltd., 1996. ISBN 0-85130-244-0. Maurer, Maurer. Combat Squadrons of the Air Force, World War II (Perennial Works in Sociology). Maxwell Air Force Base, Alabama: USAF Historical Division, 1982. ISBN 978-0-405-12194-4. McEwen, Charles McEwen Jr. 422nd Night Fighter Squadron. Birmingham, Alabama: 422nd Night Fighter Squadron Association, 1982. ISBN 0-89201-092-4. McFarland, Stephen L. Conquering the Night: Army Air Forces Night Fighters at War. Washington, DC: Air Force History and Museums Program, 1997. ISBN 0-16-049672-1. Pape, Garry R. and Ronald C. Harrison. Queen of the Midnight Skies: The Story of America’s Air Force Night Fighters. West Chester, Pennsylvania: Schiffer, 1992. ISBN 978-0-88740-415-3. Pilot’s Manual for Northrop P-61 Black Widow. Appleton, Wisconsin: Aviation Publications, 1977. Price, Alfred. Instruments of Darkness: The History of Electronic Warfare, 1939–1945. London: Greenhill Books, 2006, First edition 1978. ISBN 978-1-85367-616-1. Rawnsley, C.F. and Robert Wright. Night Fighter. London: Ballantine Books, 1998, First edition 1957. ISBN 978-0-907579-67-0. Robinson, Anthony. Nightfighter: A Concise History of Nightfighting since 1914. Shepperton, Surrey, UK: Ian Allan, 1988. ISBN 0-7607-7957-0. Scutts, Jerry and John Weal. German Night Fighter Aces of World War 2 (Osprey Aircraft of the Aces #20). Oxford, UK: Osprey Publishing, 1998. ISBN 978-1-85532-696-5. Smith, J.R. Night Fighter: A First-hand Account of a P-61 Radar Observer in World War II China. Rome, Georgia: Family of James R. Smith, 2004. Thomas, Andrew. India's Night Guardians. Aviation News, 30 October – 12 November 1996, pp. 550–554. White, E.G., OBE. Nightfighter Navigator: Recollections of Service in the RAF, Compiled from Flying Log Books and Personal Records. London: V.P. White, 2004. ISBN 978-1-871330-08-3. Wilson, Kevin. Men Of Air: The Doomed Youth Of Bomber Command (Bomber War Trilogy 2). London: Phoenix, 2008. ISBN 978-0-7538-2398-9. Eric Shulenberger (2005). Deny Them the Night Sky: A History of the 548th Night Fighter Squadron. E. Shulenberger. ISBN 978-0-9767355-0-2. Wikimedia Commons has media related to Night fighter aircraft.